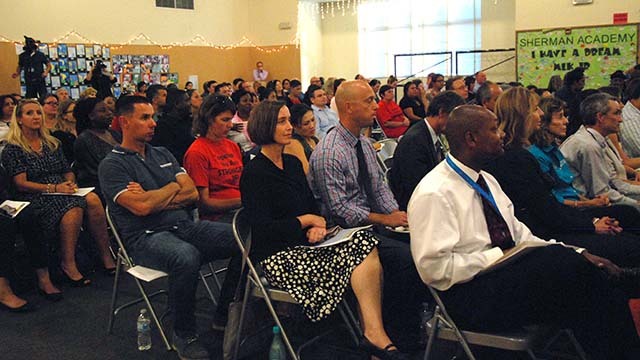 On a balmy evening in Sherman Heights, school board vice president Kevin Beiser pledged air conditioning soon for every classroom in San Diego. He vowed music programs in all San Diego Unified School District elementary schools. 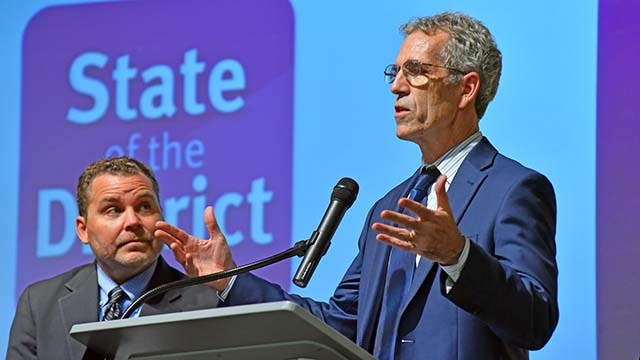 And those were just appetizers for the 100 parents, community members and district staff attending Tuesday night’s State of the District addresses at Sherman Academy, the rebuilt elementary school. Speaking ahead of schools Superintendent Cindy Marten, who called the district “strong,” school board president Richard Barrera lamented San Diego schools as “fragile” amid the challenges of families being priced out of local housing and parents under threat of deportation. 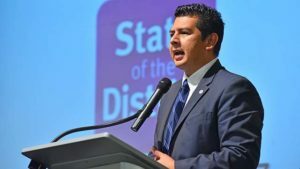 “The housing crisis is an education crisis,” Barrera said, asserting the lack of affordable homes has driven 1,000 students and their families to East County or out-of-state. He introduced a family in the third row minus a father, Gaston, who came to America at age 16 but was deported recently, leaving a wife with several high-achieving children, including a straight-A son — a senior in the district. Barrera, speaking for nearly a half-hour, vowed that San Diego Unified would operate “functionally as a sanctuary district” to shield undocumented students from federal authorities. The son of a Colombian immigrant father and a mother whose European parents arrived via Ellis Island, Barrera said he would not agree to “compromises” on immigration. “We will continue to fight for our Dreamers, and we will not agree with a system that protects students but deports our parents,” Barrera said. Moreover: “Enough is enough” of strained school budgets. “We have to go back to an investment approach to public education,” he said, slamming the state’s high incarceration rate and its costs. 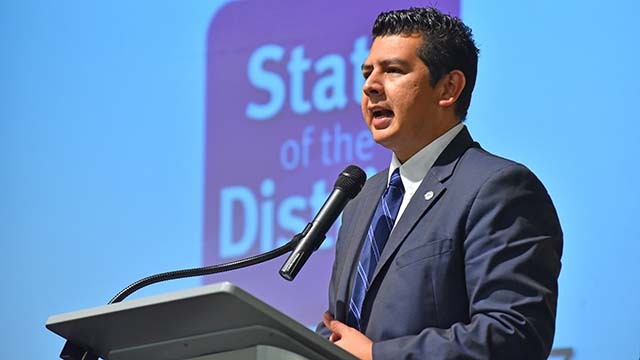 Barrera said raising district spending by $3,500 from the current $10,000 per student would close what he termed a district academic achievement gap. 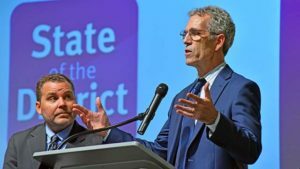 He said he would support efforts in Sacramento to close what he called a loophole in large commercial property owners’ property taxes that could mean a $10 billion boost for state schools — now ranked 46th in the nation in per-pupil spending. He quoted “The Cure at Troy,” a Seamus Heaney adaptation of Sophocles’ play “Philoctetes”: Once in a lifetime/The longed-for tidal wave/Of justice can rise up/And hope and history rhyme. For her part, Marten quoted Martin Luther King Jr., noting that 2017 marks the 50th anniversary of the civil rights leader’s final sermon at Ebenezer Baptist Church in Atlanta. Then Marten observed in a 16-minute address: “That is what I see in our young people today,” despite their selfie-taking inclinations. “We do not have all the state funding our students deserve, but, my friends, we are rich with talented, dedicated teachers and staff, who put service to children above all else,” she said. “Four years later, we can say without reservation that reform is working in San Diego,” she said. 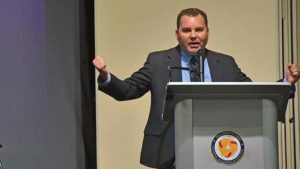 Marten made no overt reference to documents and news stories posted by Voice of San Diego indicating San Diego Unified’s graduation rates were boosted by “counseling” low-performing students to leave the district. Barrera said Sherman Academy — where Councilman David Alvarez also spoke as a school parent — was chosen as venue for the talks because of its dual-immersion English and Spanish program, where every student becomes bilingual. He said the community was clear in what it wanted when Sherman reopened in 2008 after being closed for several years for rebuilding. Parents wanted their kids to lead and thrive in a global economy and wanted students to be bilingual and bicultural, he said.